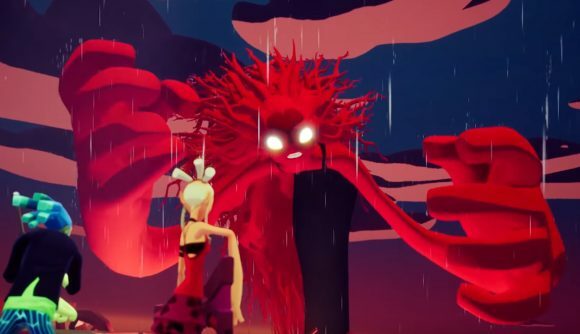 No Straight Roads is a beautiful-looking rhythm brawler from Metronomik, a Malaysian studio studio with plenty of pedigree – including co-founder Wan Hazmer, who was lead game designer on Final Fantasy XV. A new video breaks down what to expect from the game’s blend of musical aesthetics and more traditional action mechanics. Hazmer says “We have introduced a game mechanic where you can get the excitement of a rhythm game but without the pressure of following the beat.” The idea is that your character controls just as any other action game character would, but the enemies and the world around you adhere to musical rhythms. One bit of footage shows you dodging notes down a Guitar Hero-style note lane. In another example, we see bosses whose patterns are tied with the music – the implication is that predictable attacks will tie in with the patterns of verses and choruses in the music, which is certainly an intriguing take on an otherwise traditional action game. It doesn’t hurt that the art and animation look fabulous. Get a detailed breakdown in the video below. The player characters are a pair of indie rockers doing battle against an EDM megacorp. The genres will swap back and forth in each fight according to the progress of the battle. No Straight Roads is scheduled to launch in spring of this year – which despite the unbearable cold of the past week, is coming up soon. The game is set to release for PlayStation 4 and Steam.